Notes: "A stone circle with a diameter of 20.0m. measured from northeast to southwest and 18.0m from northwest to southeast. It is formed by eleven stones spaced between 2.7m and 6.7m. apart and from 0.3m. to 0.5m. high. Three of the stones are of post type and eight are upright slabs. An additional stone, 7.5m. from the northeast side and 0.3m high, is angled towards the circle and may be quite unassociated". 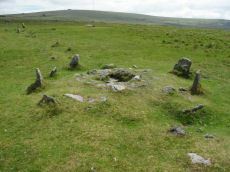 See also Legendary Dartmoor: Merrivale Ceremonial Complex. Lethbridge pp.16-18, diagram 16. Notes: "Two Bronze Age standing stones with a disturbed cairn and a number of small earth fast stones. Located in open generally clitter-free moorland. 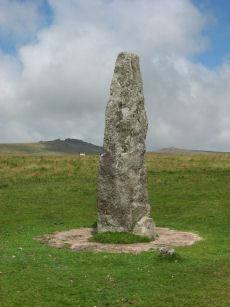 Only one of the two stones still stands; it is 3.2 metres high and tapers from the base which is 0.7 by 0.5 metres in section. Whether the stone was once the focus or terminus of a stone rows is uncertain. The second stone is now fallen, it is 2.2 metres long, up to 0.4 metres wide and 0.3 metres thick. An adjacent 0.3 metre deep pit may be its socket hole. " Notes: Merrivale Prehistoric Settlement is a partially enclosed stone hut circle settlement, including at least thirty six hut circles and four separate enclosures. Lethbridge pp.16-18, diagram p.16. 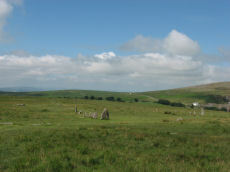 Notes: The Merrivale Ceremonial Complex consists of a stone circle a large menhir and two double stone rows and burial cairns. 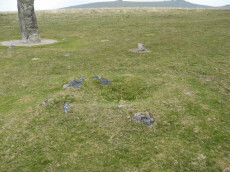 See also: Legendary Dartmoor: Merrivale Ceremonial Complex. Lethbridge pp.16-18, diagram p.16. Notes: Dixon #98. Butler Vol. 3. Map 44.8.7 (diagram of location in ceremonial complex p.24, diagram of cist p.31). Grinsell WALKHAMPTON 5. "A very fine Bronze Age cist which measures internally 2.2 metres long by 0.9 metres wide and up to 0.8 metres deep. 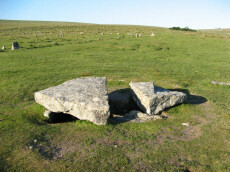 The triangular-shaped slab which forms the massive cover stone is up to 2.1metres wide and averages 0.4 metres thick; a central part has been removed by stone cutters revealing the water-filled cist and a broken fragment of the coverslab." See also, Legendary Dartmoor: The Merrivale Kist. Lethbridge pp.16-18, diagram p.16. Notes: Turner B2. Butler Merrivale Vol. 3. Map 44.8.8 (pp.30-1). Grinsell WALKHAMPTON 1. "The excavation of 1851 seems to have been thorough, completely destroying structural remains of both the cairn and the 'cist or inner circle',. There is now a circular turf covered area, 18.0m. in diameter, with random stones protruding through the surface. Off centre there is a hollow, 7.0m. by 4.0m. and 0.5m. deep." Notes: Butler Row 4. 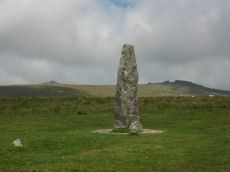 Prehistoric Monuments of Dartmoor website Menhir 1. "Stone row 4 is now a trivial affair [Butler] of 3 small slabs aligned towards a squarish block near the base of the standing stone. This area has suffered some damage over the past century. There were 5 stones in 1895, the missing one presumably accounted for by the pit which has appeared between the upper stones. This may well be the site of the cairn, C4, at the head of the rows recorded by Rowe but not included in the plans of Lukis or Worth. Nor is there much surviving from the circle of slabs around the menhir depicted in Bray's plan and recorded by Spence Bate in 1871, or the nearby cist which he excavated, C5. The Exploration Committee excavated at both ends of the row but no more socket holes were found and they concluded that this short alignment was complete." Lethbridge pp.16-18, diagram p.16. Notes: Worth Merrivale A. Butler Merrivale 1. "Two Bronze Age double stone rows and associated cairns are located on open moorland. The rows are oriented roughly east to west and are almost parallel, being 25 metres between centres at their eastern ends increasing to 32 metres at the west. A leat still used to convey water to Hillside Stables separates the two monuments and flows to within 2 metres of the northern row. A single row (see SX 57 SE 115) runs roughly south-west from a small cairn at SX 55397476, some 4.75 metres south of the south row." Lethbridge pp.16-18, diagram p.16. Notes: Butler Merrivale 2. Worth Merrivale B. For description see Merrivale A. Lethbridge pp.16-18, diagram p.16. Notes: Butler Merrivale 3. Worth Merrivale C. "A stone row and a small cairn lie to the south of the double stone rows in close-cropped moorland turf. The cairn located at the northern end and slightly off-centre to the row, measures 3.2m across and up to 0.5m high. An 0.3m deep central pit opens out on the southern side. There is no obvious kerb or cist but a transverse slab, the terminal slab of the row, is set within the south side of the mound. The existence of this slab suggest that the row pre-dates the mound. 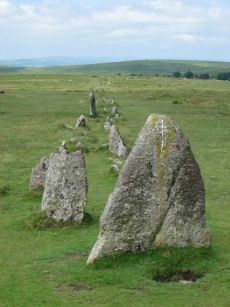 The stone row extends for 41.7m in a southerly direction to an upright stone (SX553774720). 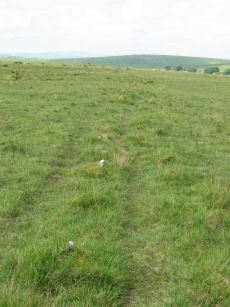 However, during the English Heritage 1999 survey a further stone was located on the same alignment beyond this stone indicating an overall length for the row of at least 60m. The new partially buried stone at SX55337484 is visible as a rounded stone 0.15m across; it is similar to others in the row. A total of six upright stones, six stones protruding through the turf and about ten slight depressions, now indicate this 60m long alignment. 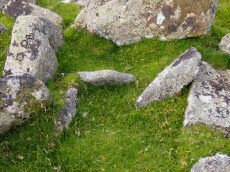 The transverse stone within the cairn is 0.5m by 0.4 and 0.15m thick. The two adjacent in line slabs are 0.6m 0.3m by 0.15m and 0.3 by 0.2 and 0.2m thick respectively. The other large stone (SX55377472) is 0.5 by 0.4 and up to 0.4m thick. The other stones are up to 0.15m high." Lethbridge pp.16-18 Row C, diagram p.16. Notes: Turner F20 - Merrivale(N). Butler Merrivale double row 2, (centre) - Vol. 3. Map 44.8.1 (diagram p.27). Grinsell WALKHAMPTON 4. Lethbridge pp.16-18, diagram p.16. 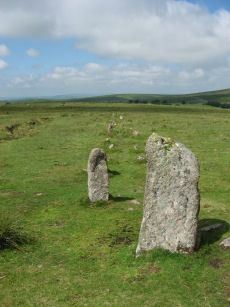 Notes: At the eastern end of the northern double stone row is the remains of a cairn and its surrounding stone circle. Notes: Turner B8. "Turner describes this site as an embanked stone circle; an annular bank of earth and/or stones with an inner edge of orthostats. Internal diameter is 8.0 meters with a bank 0.8 meters wide and 0.3 meters high. Much disturbed." Notes: Turner B13. "Base of ancient tumulus, about 20m in diameter, may have formed a bound of the ancient boundary between lydford and walkhampton (prowse)." Notes: Dixon #41. Bar Rep. 39. Butler Vol. 3. Map 44.10.1 (diagram p.34). Grinsell WHITCHURCH 2. Notes: Butler Yellowmeade 1 - Vol. 3. Map 44.1. (diagram p.17). Grinsell WALKHAMPTON 7 (Yellowmeade Farm).